What will my little one wear to the wedding? Ahh, it’s a tricky question. What should kids wear to a wedding these days has becomes an important question not only for parents but also for the kids’ themselves. #PrincessHeer is so particular about what she wants to wear that it amazes me. I have enough of an issue sorting out myself let alone my little one! But luckily help is at hand, there is more choice than ever when it comes to dressing up the little ones. Especially for formal occasions, one can find something trendy, smart and durable; however, the catch is there will be plenty of running, jumping and sliding during the event especially on the dance floor and you need some clothes indeed. The feeling of running around shops for something I thought would be really simple only to discover, whatever it is, is sold out or is completely non-existent. Did I mention this is a day before the big occasion? Of course, with online capabilities and time on your hands, you can find the perfect outfits for the kids without any hassle. Who knew! Click on brands like Kidology.in to choose from high-quality fashion ready-to-wear kids’ clothing and accessories collection and be ready within minutes. The designer kidswear brand specialises in fusion wear that beautifully incorporates western elements in Indian wear. Hues of pink, peach, coral and green look good on children in the daytime. If you are attending a night function then carefully choose tones of teal, turquoise, yellows and reds for your tiny tots. A pretty satin bow for girls or a bow tie for boys is cool. Add the extra 'oomph' by making them sport some accessories.Young girls would not only look graceful with a pair of earrings but they will also look equally adorable when they wear fairy shoes or sparkly jewellery and big hair bows. You can also opt for princess tiaras or floral crowns to add a touch of grace to the western outfits. Boys, on the other hand look charming when they wear a bow/tie matching their belt, or when they sport cute cufflinks with their favourite cartoon characters on it. Also, trade the sneakers and boots with mojris and juttis. Colour or style coordinate your outfit with your kid's to create an outstanding look. You can replicate the pattern and design in your kid’s outfit similar to the way it's styled in your dress. You can either go with the same colour combination or same styling to get that perfect wedding party look for your child. Traditional silhouettes on young girls make for a picturesque wedding scene. Pick between a flower patterned angrakha kurta that would make your kid look ethnic chic or go for a short, colourful sleeveless anarkali kurti and churidar for a more traditional appeal or you can also opt for ruffled kurta. The task is even simpler through Kidology as up for grabs is a wide range of designer Indian wear for girls. Your budding gentleman needs to sport the rich cuts and regal colours for the wedding season. Boys should be dressed in trendsetting brightly-hued kurta pyjama or a pathani kurtas. For a cocktail party, the little monster can be dressed in a smart shirt, half-waist coat and comfortable-fitted trousers. 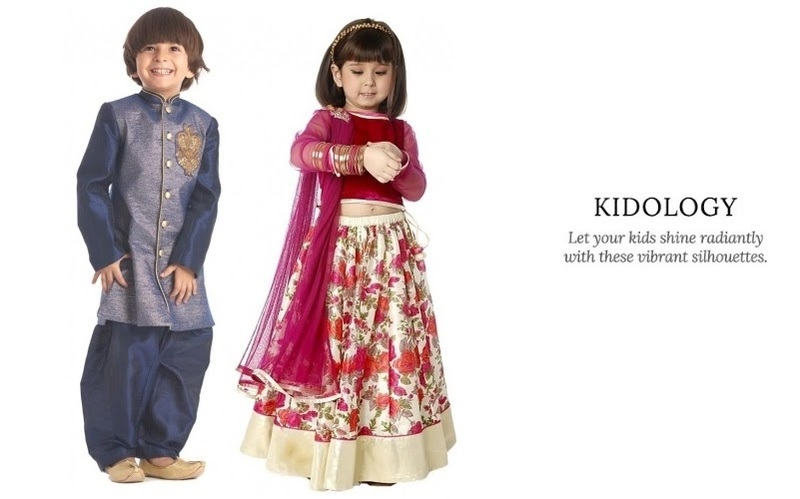 Hope these tips will come in handy while shopping for designer kidswear for your little ones.